When: Sunday, May 11th, 2019. Starts at 9:00 AM. Clean up starts at 5:30 pm! Who: Anyone interested in playing boardgames & miniature based games. Kitchen will be run by Al Ritchie Community Association. CASH ONLY for food and drink. Breakfast, lunch and supper served! No outside food permitted in the venue. The Al Ritchie Community Association (ARCA) has been actively advocating on behalf of the community and helping to serve its social and community needs since 1987. Priorities, goals and activities are determined through interaction with the community at meetings, established programs, events and direct contact with our staff and board. The association operates with the philosophy that residents know what kind of programming they need and want. 1) You must post on this thread to sign up for a game, run a game, or just let us know you're attending. 2) You must attend the event and sign our log book with your SaskGames I.D. 1) Schedule a game on the forum with open spots for sign-up. 2) All Volunteers will get a bonus entry (Table registration, Learn to Play, and event set up). We appreciate all the help! We will randomly determine all winners after the event and let the winner know they've won. We will announce all winners in this forum. We will also be giving away TBA. We will be giving away TBA at 12:00pm. To win you must be signed into the log book, and have made a post of this thread saying you're coming out, running a game, or signing up for an event! You must write your SaskGames I.D. in the logbook to qualify. Teaching easy / accessible games to people. "Learn to Play" is a PGX initiative to help introduce new games to PGX attendees. Game teachers will teach a single game to groups of people over a two-hour block. Please contact us here if you're interested in volunteering. No sign up is necessary. Drop in to learn one of these games. NOTE: There will be a Blue Lagoon tournament at noon! NOTE: There will be a Ticket to Ride: Europe tournament at 2:30 pm! The category "board game" encompasses many a game, including several card-based games, and games that do not make use of a board! Party games, strategy games, family-friendly games, war games, dexterity games and even card games will be represented. 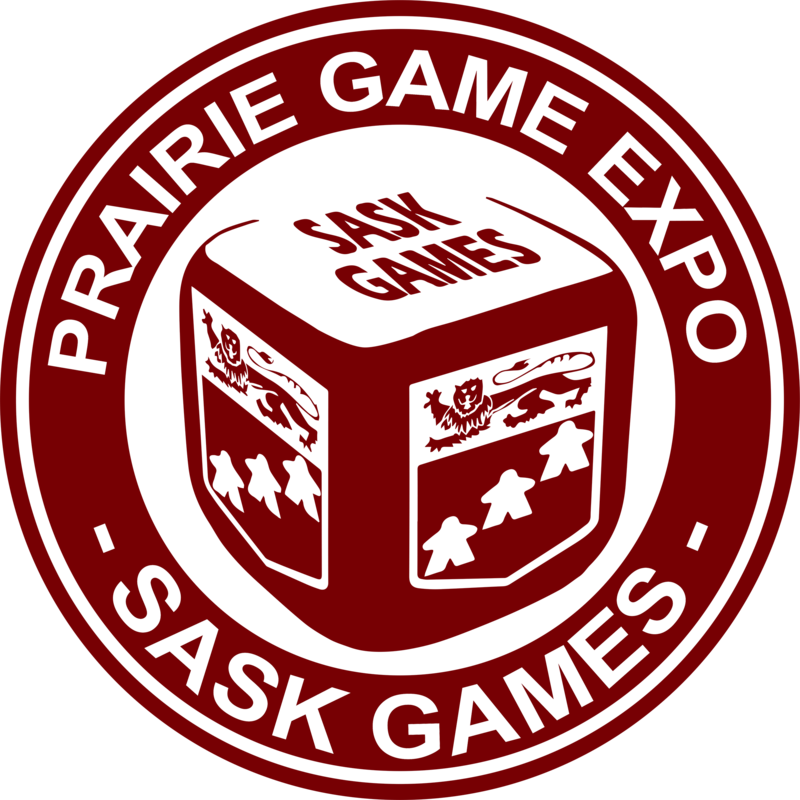 Listed below, you will find the list of games scheduled to be played at Prairie Game eXpo. You are welcome to post on this forum to sign-up for a game. Please ensure you arrive in time to play the game. If your plans change, please post here as well so your spot can be opened up again. This list, the times, and the players are subject to change. You are also welcome to bring your own games to the event and play at your leisure, or show up with no games and simply see what you can get into. We will be running organized tournaments at Prairie Game eXpo. Past tournaments have included King of Tokyo, Setters of Catan, Ticket to Ride, Camel Up, Dominion, Dixit, Ganz Schon Clever, Kingdomino, Smash Up, Azul & more! Please watch this space as we unveil our schedule. Please reserve your spot here. Feel free to tell us what you'd like to see at future PGX events. PRIZES: Winner receives Deluxe Milk Takers Train set, all players at final table receive a set of translucent purple trains. PGX is a great place to showcase the many diverse miniature games in the hobby. PGX has hosted events for all sorts including Warhammer (Age of Sigmar, 40K, Kill Team, etc), Warmachine, Infinity, Star Wars X-Wing, Star Wars Legion, Gaslands & more! DETAILS: Gaslands is a tabletop miniatures wargame of car-on-car destruction in a post-apocalyptic wasteland. Miniatures are Hot Wheels / Matchbox cars modified to look like post-apocalyptic machines of speed and destruction. Players will use one of several customized vehicles designed by Chad and his family. These vehicles will race across a post-apocalyptic wasteland populated with terrain crafted by Chad and his family. Other players of Gaslands are invited to come to Prairie Game Expo, as well, to show off their builds and race against other players. Saskatchewan has a growing community of board game and role playing game designers. PGX supports local game designers showcase their games by hosting a "Game Designer's Corner" in which there will be demos and play tests of local designs featured throughout the day. Contact Derek (lifeofturner) for more details! We will be hosting an area at PGX devoted to role-playing games. If you would like to run a RPG event please let us know. Past games have included Pathfinder, Dungeons & Dragons, Star Wars, 3 6 9 & more! DETAILS: Mel from the Saskatchewan Starfinder Society will be running a two-part session of Starfinder. This special scenario is for no more than 4 players so pre-registration is required. If you are interested in this session you can register by responding to this post. Please not if you sign-up for this you are signing up for BOTH parts. What Helms the Hide is a series of four quests designed for levels 1-5. What the Helms Hide includes four 1-hour adventures that send the PCs across the Inner Sea region to uncover the secretive Decemvirate's past. Disagreements among the Pathfinders erupted into violence 300 years ago, spurring the Society's leaders to don helms that hid their identities and protected them from assassins. These ten members of the Decemvirate have remained anonymous to this day, but a recent discovery may uncover new information about this dangerous part of the Society's history. With a unique window into the past, it falls to the PCs to identify these original leaders and the secrets they buried before donning the helms—in the process helping to unveil a hidden threat to the Society. DETAILS: Dreaming of the Future includes four 1-hour adventures that take the PCs into the asteroid field of the Diaspora and across the Pact Worlds of Aballon, Liavara and Verces. It's for levels 1 - 4. The Starfinder Society pursues the dream visions of a Liavaran dreamer, seeking information lost in a time before the Gap. Three broken fragments form the key to a forgotten repository of knowledge hidden within the Pact Worlds. It's up to the PCs to find these missing fragments and brave the dangerous reliquary to secure a new source of prescient knowledge for the Society. DETAILS: The most recent edition of Vampire The Masquerade RPG is at Prairie Game Expo for the first time! A coterie of vampires has been summoned by the 'powers that be' to deal with a situation and earn their place within the court of vampires. This session is new player friendly. Pre-generated characters will be supplied and no supplies are needed though you are welcome to bring your favourite set of D10 dice if you want. This RPG is not intended for children. Registered in advance is encouraged. DETAILS: Pinegrave is a small forestry and mining town that's population ebbs and flows with the seasons based on work. One year an elf named Alma fell in love with the town and resided there and made potions for adventurers and nobles a like. Lately she has become short tempered and disappeared recently and you are sent out to investigate. Perhaps it's the latest influx of strangers, or maybe it's the increasing noise and odd lights coming from deeper in the mountain range. This is aimed towards newer players and you will be provided pre-generated character sheets. If you have dice or writing instruments please bring them but the DM will have some spares. All the player classes and races in the standard Player's Handbook will be available. DETAILS: Set in the city of Waterdeep, Volothamp Geddarn hires you to recover a missing key, where you find yourself wrapped up in a series of murders in Lower Skullport. Can you find the killer before they find you? Players will be provided with pre-generated characters at level 8. The DM will have plenty of dice, pens, and paper but if players are encouraged to bring their own pencils, pens and dice if they have them. Players are also encouraged to bring a Player's Handbook.